The Black East Indian was standardized in 1865. It shares it colour with the North American Cayuga. It has other names such as Buenos Aires, Black Brazilian or Labrador. 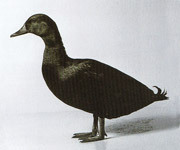 There is speculation that the black gene may have arrived via a close relative of the northern mallard, the American Black Duck (Anas rubripes). This is a bold assertion of early historians of the Cayuga and it seems equally applicable to the Black East Indian. The drakes tend to retain their black plumage but the females develop patches of white as they get older. Impure black birds can show elements of brown penciling, especially under the wings and throat.